In addition to these I have a few of the Variants: 2 Poles, 2 Romys and 4 of the Yugo M57s. Yes, I like the TTs and the 7,62x25 cartridge. Cold you tell us the years of production? Left to right: '44, '45, 52 all Izhevsk. 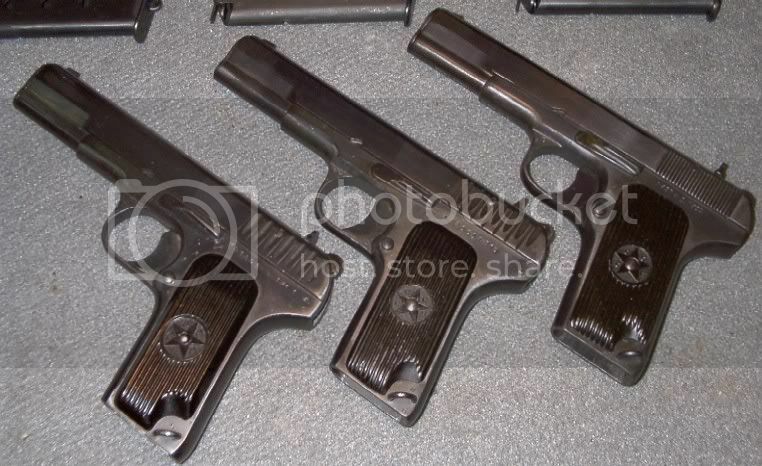 Yes, "tetejka" is a common word for TT-33 (and other from that Russian pistol family). TT is phonetic sound Te-te, so tetejka is Pistol TT. In Slovenia and in other Balcan states and probably in all Slavic language areas. "tetejka" ... I have found myself repeating that word since I first read it in your post. I really like the sound of it. Thanks for the explanation/education, M67! For you is phonetically (in English) more close "Teteykah"
I picked this one up for $169.00 (CDN) a couple of years back. A lot of TT's showed up in the last few years in Canada, but most of the ones available now are over $200, and many have a large billboard TT- C on the slide. Btw, there's an excellent sticky on the TT33 over on the Canadian Gunnutz forum. I skimmed the forum rules, didn't see anything about linking to another forum, but I don't want to post the link, in case it's against the rules and I just missed it. It's good to see this forum back. Oh Ya I can't see them, do I have something set wrong? S.B. Click on your name in the upper right to see your profile. Click on that to open up the User Control Panel. Then: Board Preferences, edit display options. Look to the right to see which buttons are clicked, especially the first one: "display images within posts". I will have to post a few pics of my 1941. All numbers match, including the magazine.